One of my goals in the new year is to find ways to reuse things I have around my house. Since my daughter has a near obsession with milk, the one thing I am always recycling is plastic milk jugs. There are days I think I would be better off just buying my own cow but until my home owners association is willing to overlook livestock in the back yard, I am stuck buying milk in jugs from the store. I decided to start doing a bit of research on creative ways to reuse plastic milk jugs. If I could keep just one or two out of my recycling bin a month I think it is a step in the right direction on my ‘going green’ journey. 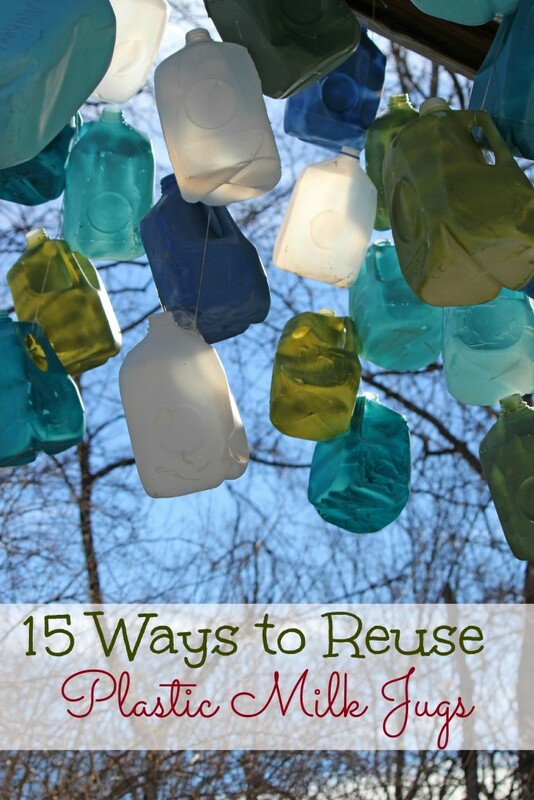 If you find yourself drowning in plastic milk jugs like I am, here are a few creative ways to reuse them! 1. Spread salt to thaw driveway ice. Slice the bottom off a capped milk jug and fill the top with driveway salt. Hold on to the handle and flick your wrist to throw salt over your icy driveway. 2. Protect seedlings in the garden. Cut the bottom off a gallon jug and set it over your seeding in the garden to act as a mini greenhouse. Remove the cap as needed to control temperature and humidity. 3. Pantry Storage for grains, rice, oats, beans, popcorn. Just make sure that the plastic milk jugs are thoroughly washed with soap and dried before storing anything in them. 4. Chill out a large cooler. Fills jugs three-quarters full with water and freeze. Place in a large cooler for a back yard BBQ or in the living room for your next football party! 5. Driveway Luminaries – Use to light the sides of your walkway. Cut off the top, put an inch or two of sand inside and add an LED light or candle. 6. Craft containers: Use a sharp knife to cut the top portion of the plastic milk jugs off. Fill bottoms with crayons, markers, pompoms or whatever other craft supplies you need to store. 7. Hand weights – Need a little resistance training? Just fill plastic milk jugs with water and start working out. 1 gallon of water equals 8 pounds. 8. Make a watering can or sprinkler Turn your plastic milk jugs into a sprinkler or watering can with a sprinkle spout. 9. Slug trap in your garden. Cut the bottom off your plastic milk jug about 2 or 3 inches from the base. Sink it into the soil so the top rim is level with the soil. Fill with beer (slugs love beer…just don’t use your pricey microbrew). Wait for slugs to drown and discard. Repeat as needed to protect plants. 10. Berry picker: Cut the top off the milk jug at an angle to widen the opening but leave the handle intact. Slip your belt through the handle to free up your hands for picking. 11. Tray under house plants. Cut the plastic milk jugs so that only the bottom 3 inches remain. Place under plant to catch over-watering. 12. Family vacation fund bank. Place it in an out of the way corner and fill with coins/dollars as you find them in your wallet. Come summer vacation, you will have a nice savings to spend on yourselves and you probably didn’t even miss it from your budget! 13. A game for your kids: Cut off the bottom of the jug (just the bottom inch or two.) Decorate the jug with stickers, markers,etc. Using old tennis balls, you now have a ball catcher game! 14. DIY Dustpan. A plastic milk jug can make a great dustpan. Click here for detailed instructions. 15. Weights. If you need to put a tarp over your wood pile or patio furniture, you can use milk jugs filled with water or sand to weight it down. Do you have any other creative ways to reuse plastic milk jugs?